If you have a large number of contacts to send messages to, you will likely want to upload a list rather than type in each contact manually. First, choose which SendTree you want to upload your contacts to by using the "My account" menu at the top of the page. 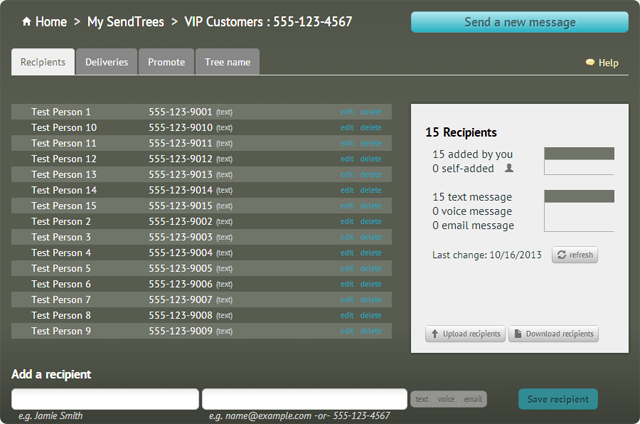 In this example we have a SendTree named "VIP Customers". 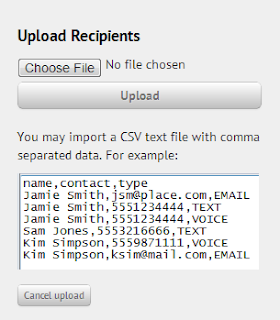 Click "Choose File" to choose your CSV data file, then click the "Upload" button to upload the data to SendTree. But first let's have a look at the CSV file format used for uploading the data. 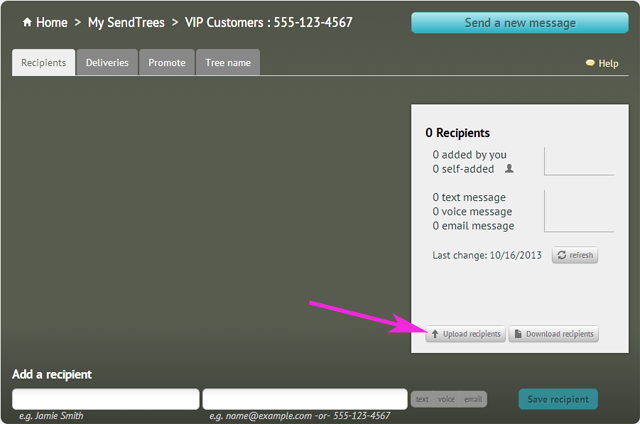 The first column is the name of your contact, the second column is their mobile number, and the third column tells SendTree that you want to send TEXT messages that phone number. 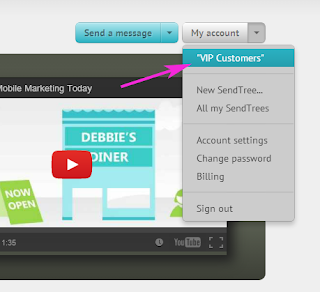 You can specify either TEXT, VOICE, or EMAIL for the message type. You would supply an email address instead of a phone number is the latter case. Here's an example having three different people, showing each message type. Keep in mind that if you have one person who wants to receive a TEXT and an EMAIL, then you simply include that person for each type of communications that want. 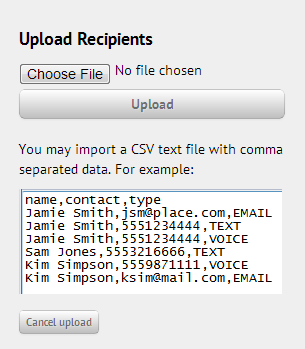 For example, this person "J. Smith" will receive a TEXT, a VOICE message, and an EMAIL. With this CSV file, you can now click the "Choose File" button, choose this file, and then click "Upload". The recipients page should reflect the newly imported contacts. Knowing how to upload your contacts will make it practical when you already have contact information in another form. You might have to use a spreadsheet to isolate the three columns of data. 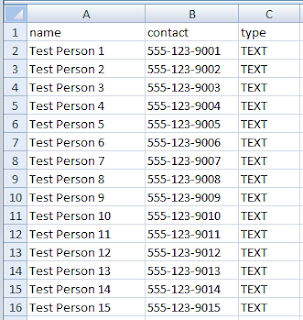 Just copy/paste and organize your data in a new sheet and save-as a CSV file. 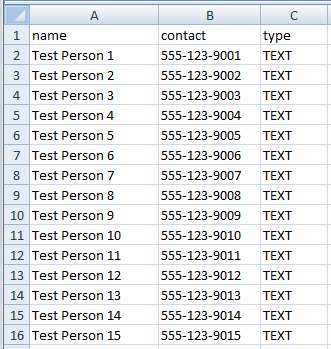 Note that you do not have to use a spreadsheet to create a valid CSV file. You could create or edit your data with a text editor, like Notepad or Textedit. But pay careful attention to your use of commas and quotations. 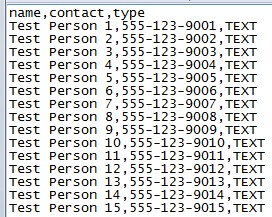 If you build your own CSV file, take a close look at where the double quotes and the commas are placed.